I survived the salon. I was described as “glowing” by Marco and Jocelyn — before the big equipment rolled out. It must be those hot flashes I endure nightly. People are beginning to notice. I must be singed around the edges or something. Crispy crunchy. It most certainly can’t be my personality, which isn’t exactly electric. Magnetic? Hmmm… Nevertheless, they were glad to see my money —the MoH’s cash —my plastic that the MoH pays for me again. And that’s the RT in the photo. I just wanted to see your jaw drop onto your keyboard. No matter how much I try to get the lovely people at the salon to understand that I don’t care what they do with my hair, they’re fairly conservative. I beg for layers. For dark hair. For sassy. But I get, “Blonde works best for your grey areas because it blends as it grows out.” What they’re most likely worried about is whether I have lawyers ready to slap a suit on them for ruining my hair. Paradise, remember? Like a good client — well, except for that 10-month lapse — I give in to their suggestions every time knowing that they really don’t want me to look like Pepe le Pieu. I tell them, “Short is okay.” But I get layers that only I notice. Conservative ones. They must know how much I’m damaged by having to wear underwear on my head when I was little. They must know how much I like hair that goes where it is supposed to go. And they totally understand that I have to have a pony. They probably figured out a long time ago that I’m fairly high maintenance even though I love to suggest that I’m not. Might I lobby for being discriminating instead? It was a relaxing catch up session, and a leisurely perusing of Fast Company magazine — my attention captured by an article on Travis Knight, the man who will inherit Nike, and another about Al Gore’s $100 million makeover. I should have been looking at a magazine with humongous photos, because I didn’t have my glasses. But I’m a great masochist — especially with an audience, so why not act like I can see the page? The fact that my arm was extended as far as it could possibly reach most likely gave away my sham, but the ordeal kept me occupied during waiting time between coloring, and accelerating. Shampooing and massaging. Cutting and blow drying. Ironing and trimming. It was a serious challenge to yank the magazine in each time a stylist dashed by to greet a new client. Or cruised by to check on someone’s foils. And if they hadn’t moved me from the spot where I was braising under the hood, my extended arm most likely would have been the cause of one client hitting the deck. The one who caused the whole salon to freeze. Then Marco whispered to me that it was only Mary, a mature client who usually arrives for her appointments loaded on OxyContin. Do drop in, Mary! Unfortunate, actually. The salon used to offer red or white wine in addition to hot herbal tea or mineral water, but can you imagine Mary imbibing? Evidently, there was some concern about clients oozing out of their chairs and on to the floor in mid cut. It was thought that might not be good for business to have clients in Paradise laying on the floor with their drawers showing. And you should feel quite special, because it was a bit damp outside this morning on my walk, and damp and my hair don’t exactly mix. I was a veritable fuzzball by the time I got back home. A poodle. An urchin. I had to fix it up again. Just for you. There. I’m thinking Keira can have her gorgeousness. I can muster up some glam myself — sans the battery operated fan, of course. Because it would mess up my hair. Not quite Grace in the Fabulous Fifties, and no, not Shelly in the Esoteric Eighties. Just me, in the…um… ah…well, now. Oh-tees? Whatever. So Tah-Dah. Aren’t you glad that’s over? And just in time for Friday. The sky is completely gorgeous today, a soft breeze is ruffling the trees, and an amazing 76 degrees is helping things along — including the eau de dog whiz wafting through the window. I’ll have to find somewhere to swish my hair tonight. Somewhere other than this room and for someone other than PhotoBooth. I’m thining the MoH is elected, lucky dude. See what happens when you drop out of society? It’s all down hill from here. But with great hair. Kind of like dying with your boots on. Well aren’t you quite the hottie? You look great girl!! I’m so jealous. it looks great!!!! i have had the same hair, minus the about 6 inches of the length since 1985… yep that one with the big hair… thats me… thick curly wavy frizzy,, whatever… and now to add insult to injury,, i am growing out the color and in the gray!!! what the hell is wrong with me????? Thanks Paisley. I keep trying for the grey, but can’t figure out how to do it without chopping all of it off. I wouldn’t be opposed to that at this point, but I guess I’m going to have to do it myself. What’s your plan? I need one that’ more cost effective. Looks great! 🙂 I love that it took you two posts to report on the new haircut – most people would not take the time to give an update – It was great! Getting my hair washed is my favourite part of the salon experience. I wish I had someone to wash my hair for me every day and massage my scalp. Thanks, Ritzy. I’ll pass on the pedi, tho. The whole idea of someone messing with my feet grosses me out. Go figure, huh? And as an aside… what’s wrong with gray? Maybe guys view this differently. Okay, Dave, I agree. I was probably a guy in my last life. And I have been fighting this whole grey thing for a while — way before I could’t afford it any more…What you may not understand is that a person would have to cut all all their hair to do the “go grey” thing. Otherwise, they would look like an advanced version of Pepe la Piew. You know. The skunk. Just be a chick in your next life and you’ll get it. Love it. It looks so healthy and clean. classic graceful hair. wonderful. They do know what they are doing over there! 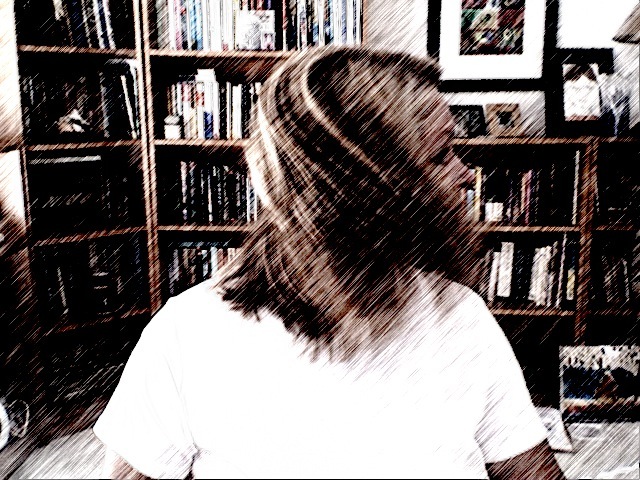 ps… how much do you LOVE photobooth! Oh I LOVE it. You look gorgeous. You’re funny. And I mean that in a you’re making me laugh way. Call me shellfish but I think that’s a good thing. But I’m confused. When you say “have to have a pony” – is that “pony” as in the before the cut picture, or “pony” as in Sid (from “Toy Story”) dreaming and talking in his sleep? Jenny, You know I did this post mostly for you, right? Okay, and for my mom and sister. Otherwise, no way. Everyone would have had to deal with just the back o’ my noggin’.